Where else have you seen such soft color-kissed hues? The early morning sky at the beach? How about the opalescence discovered inside a seashell? Or, perhaps the rainbow sherbert and salt water taffy sold under striped umbrella awnings along the boardwalk? Chances are you've seen these delicate shades wherever there is surf and sand. Now, you can summon that "toes in the sand" feeling with our Tropical Cool Toursade Earrings, no matter what the season. 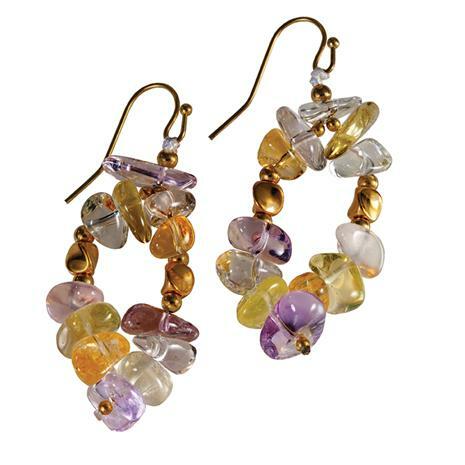 These toursade earrings have 50-carats of amethyst, citrine and other stunning natural translucent stones creating layers of pastel shimmer to grace bare skin or pop on darker clothing.